AD 54. Claudius is dead. Rome is in turmoil. And two brave heroes of the Roman army face the challenge of their lives. Macro and Cato return again, 16 books in and the boys have grown, matured and changed. The new relationship with Cato as superior is well embedded and Macro is starting to take on the mantle of the soldier coming to end of his career, jaded (well as much as Macro ever could be), and sick of the politics and BS that defines how his life may end. Cato with his rank is more mired in the the politics, yet as a man from the ranks likes it no more than his rough and ready colleague. 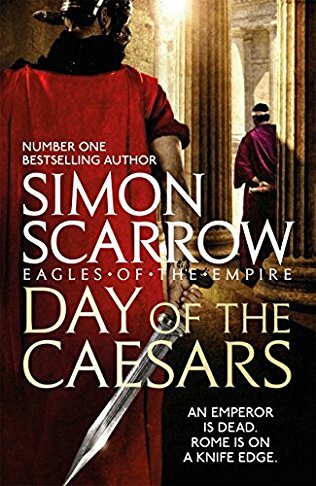 In this book Simon Scarrow weaves a tale that’s more intrigue and thriller than the action and battles that have come to define this series, that’s not to say that macro and Cato don’t get the stabby parts of their blades wet and gory, because they most certainly do. But this book is more subtle, its the interplay of republicans and a dynastic squabble over the next emperor, and how despite everything our duo try to avoid it, yet they still get sucked into the storm of change. Old enemies reappear, new enemies are made, this is another major turning point in the life of Macro and Cato, its a book not to be missed in this epic series that has helped shape the Historical Fiction genre.